Snooper Shotsaver 210 is a great value golfing device that will help you understand distances on the golf course. The Shotsaver 210 features 99% of golf course around the UK and Europe and is preloaded with over 5,000 golf courses, so it is ready to use straight from the box. There is a monochrome 2-inch display that is sunlight readable and the device is waterproof. Power saving modes save power such as after 10 minutes of no-use the unit will turn the LCD screen off automatically. After 30 minutes of inactivity the Snooper 210 will turn off. Snooper Shotsaver 210 has been discontinued. For the latest range of golf GPS systems click here. 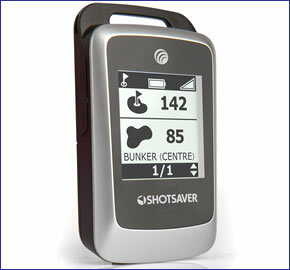 Snooper Shotsaver S210 GPS golf range finder comes preloaded with over 5,000 golf courses from around the UK and Europe. The information provided includes distances to the hole, front, back and middle of the green. Distances to hazards, such as bunkers, are also included. The Shotsaver S210 is very good value for what it does however if you want to be able to view the actual golf course and zoom in you should buy the more expensive Shotsaver S430. The Shotsaver 210 is compact and waterproof. The screen is a monochrome, 2-inch sunlight readable LCD. The S210 Golf GPS system will connect to GPS satellites in seconds so you are quickly ready to use the GPS system on your chosen golf course. 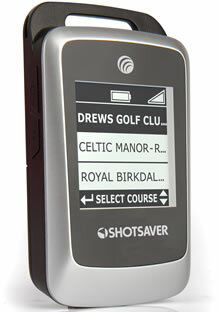 When you are at a golf course, the Shotsaver will automatically locate the golf course on screen. Power saving modes save power such as after 10 minutes of inactivity the unit will turn the LCD screen off automatically. After 30 minutes of inactivity the Snooper 210 will turn off. Because the Shotsaver 210 compact and waterproof you can store this GPS system in your pocket or clip it to a golf bag using the included carabiner clip. The Snooper Shotsaver 210 requires 2 x AAA batteries to provide power to the Golf device. The Snooer S210 Shotsaver requires a Windows PC with the following PC requirements: Windows 10, 8, 7, 2000, XP, Vista and with internet access.